Baltic container shipping has seen fundamental structural changes in the last decade. Its long-term future looks equally interesting with Maersk among an expanding group of container lines exploring the Arctic route, plus growing overland links to China . This inherently brings both risks and opportunities to regional stakeholders. At ClipperMaritime, we aim to track shipping activity to its most granular level while contextualizing this within macro economic and deep-sea shipping trends in order to provide our clients with best in class data-driven decision making tools regardless of their size or internal analytical clout. AIS-driven data round port call frequencies, sizes of vessels, and owners / operator breakdowns at a specific port. 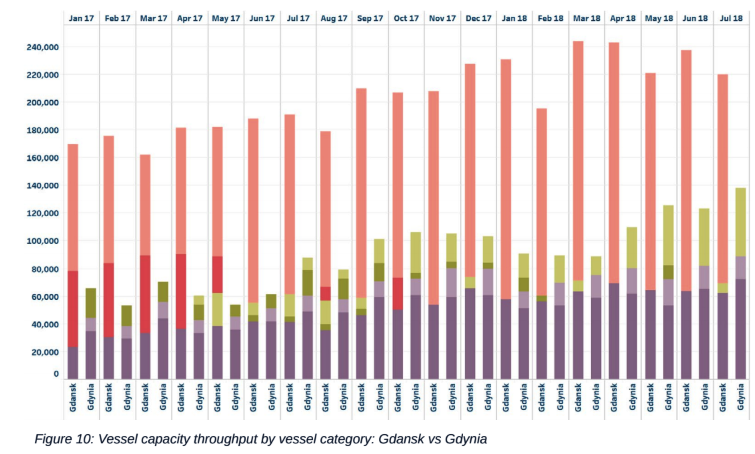 Given its current profile, we have focused this aspect on the port of Gdansk. All data presented in this report is available on an ongoing basis through our interactive dashboard tool: get in touch with one of our team to explore further. Total 2017 containerised trade in the Baltic states has grown by 5.56% compared to the same period in the prior year. This is comparable to the 5.96% growth realised across the rest of Europe. 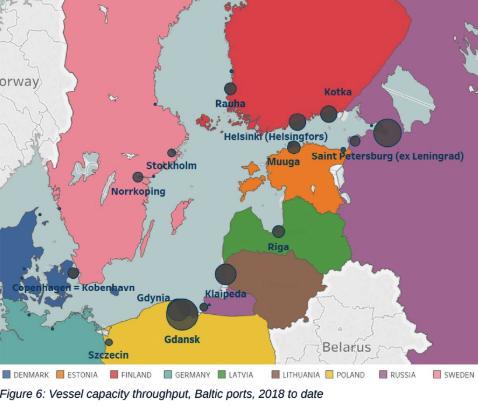 To better understand long term volume trends, we assessed growth factor metrics for the Baltic ports and benchmarked them against the rest of Europe. Year on year and overall trends are generally representative of each other, with Baltic traffic lagging slightly behind that of the rest of Europe. GDP throughout the Baltic region grew by 17% in the 10 years from 2007 to 2017 was 17%. This overall figure is driven by its largest economies, Poland and Sweden, growing by 33% and 17% respectively. TEU has grown strongly in relation to GDP: over the same time period the region has grown at a ratio of 2.03 : 1. We have developed a methodology, built around AIS technology, which captures all container vessel movements in relational databases. These update in real-time to enable the most up to the minute analyses to be carried out. further contextualised in the accompanying bar chart beneath. down in to significantly more layers than are available elsewhere. Due to their varying geographic, physical, or commercial natures, certain ports attract different vessel types. We demonstrate this, and changing dynamics over time below, comparing Gdansk and Gdynia. fill out the form or call us on +44 20 7469 4118. From our global office network in Europe, the US and Asia our team has Arabic, French, German, Italian, Hindi, Mandarin, Portuguese, Russian and Spanish speakers that are able to provide around the clock client support.